The Ultimate Guide to College Soccer ID Camps | What they are, what to expect and how to find the best ones. A guide to pretty much everything you need to know about college soccer ID camps. Just in case you have any doubts, let’s clear this up at the top. If you’re even thinking about the possibility of attending college and playing soccer, you absolutely need to attend some college soccer ID camps. In attending, you will be giving yourself the opportunity to experience the life of a college soccer student-athlete before committing to anything in full. Also, you can make sure that the coaching style of the coaches is the right fit for you. Because not all soccer coaches are created equal, you probably know this. So, what exactly is a college soccer ID camp? A college soccer ID camp is typically a 1-2 day event, at which you will meet with, train with and generally spend time with a college soccer academy/institution and their coaches. You will find that you will be training with a bunch of like-minded young soccer players and it will be a great chance to meet new people who have the same goals as you. Which is awesome! It’s also a fantastic opportunity to showcase your soccer skills and talents to coaches who could potentially be the ones to take your soccer career to the next level. In addition, you’ll probably get the chance to meet some of the staff who you will be seeing each day should you join, particularly on the academic side of things. What is a typical day at a college soccer ID camp? 09:00: Breakfast with the coaches and fellow players. On the second day, you may only do one session and be finished by the early afternoon. What do I need to take to a college soccer ID camp? Each college soccer academy or institution will probably have a different way of going about things. So it’s advisable that you make sure you read the itinerary (or any other paperwork) you receive as this will likely have everything you need to know within it. However, if things aren’t clear, don’t hesitate to email or call the academy or institution to ask if there’s anything you should specifically prepare for. In terms of kit, that should probably have you covered. How do I find the right college soccer ID camp for me? Eventbrite is always a good place to start, but also you could simply ask your coaches or friends for recommendations. How much do college soccer ID camps cost? The price can vary but you should expect to pay $100-$500+ for a typical college soccer ID camp. The price usually depends on the length of the camp or even the exclusivity of being involved. How will I be sure that I’ve picked the best college soccer ID camp? As with any investment of time and money, you often won’t know until the ID camp is over. Do your research, check their social media and website. Is it active and of high quality? Get in touch via telephone or email and ask questions. Read and watch testimonials from previous attendees. If you can’t find any, consider this a red flag. If you know people who have been in the past, ask about their experiences. In general, college soccer ID camps are great experiences and you should try your best to get involved with more than one to ensure that you get a well-rounded view of what your next steps could look like. Who are we to talk about college soccer ID camps? For one, we run multiple every year. If you aren’t sure who we are, we are Richmond International Academic & Soccer Academy (RIASA) and we offer our student-athletes a UK/US-accredited degree alongside a pro soccer academy experience in the UK. 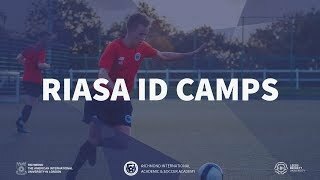 We have recently announced our 2019 college soccer ID camps and we can’t wait to meet T the next generation of RIASA student-athletes who want to pursue their dreams of professional soccer in the UK whilst earning their dual-accredited US/UK Bachelor’s degree. You can sign up to our 2019 college soccer ID camps by clicking the link below. Alternatively, if you’d like to hear about our future events, simply input your name and email address below. Got questions about college soccer ID camps? Feel free to leave a comment below!